.. teaching through enlightened miracles. There is an interesting parallel between the conception of Tilopa and that of the present Karmapa. In both cases, the parents turned to a holy man in their attempts to secure the child they wanted, had their wishes fulfilled by the birth of a son, born amid unusual signs, and then turned out to be the parents of a wonder child, whose life, even from an early age, was to be guided by the greatest spiritual teachers of his time. "...your father is Cakrasamvara and your mother is Vajravarahi .."
On her advice, he frequented monasteries and gradually took up a monk's life, eventually becoming an erudite scholar and an exemplary monk, known as Praj�abhadra. Following a vision, he discovered a text hidden in the base of a statue in the monastery. Not understanding its meaning he prayed to his dakini mentor, who sent him to the illustrious gurus Matangi and Saryapa to study tantra. Returning some time later to the monastery, he furthered his classical studies. Another critical encouter with his celestial dakini teacher initiated him further and definitively closed the gaps that existed between his theoretical knowledge and his experiential insight. Following this, he travelled widely in India, going from guru to guru until he had assimilated the very quintessence of each major strand of vajrayana teaching of the day. 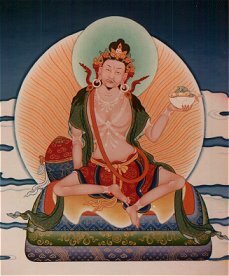 In particular, he received from Saryapa the teachings on purification of chakra and subtle body, best known these days through their Tibetan name of tummo. From Nagarjuna he received the illusory body and radiant light teachings; from Lawapa the dream yoga; from Sukhasiddhi the teachings on life, death and between-life states (bardo) and consciousness transference; from Indrabhuti teachings on insight (prajna) as the balancing of energies and from Matangi the teachings on resurrection of the dead body.